Yesterday-Today-Tomorrow, Kiss-me-quick. 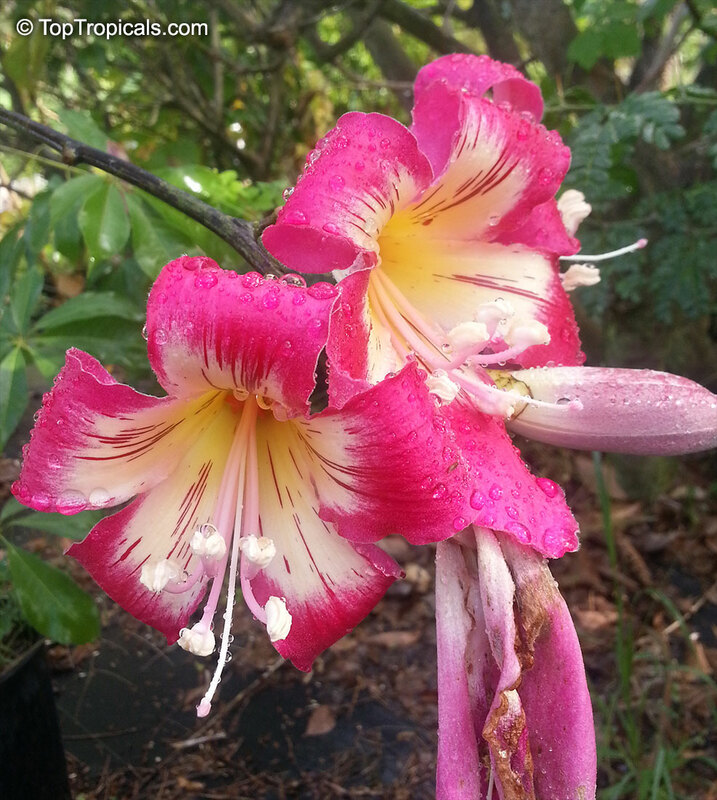 Showy flowers changing color from purple though pink to white within 3 days. Takes sun or shade. Jims Giant Brunfelsia. 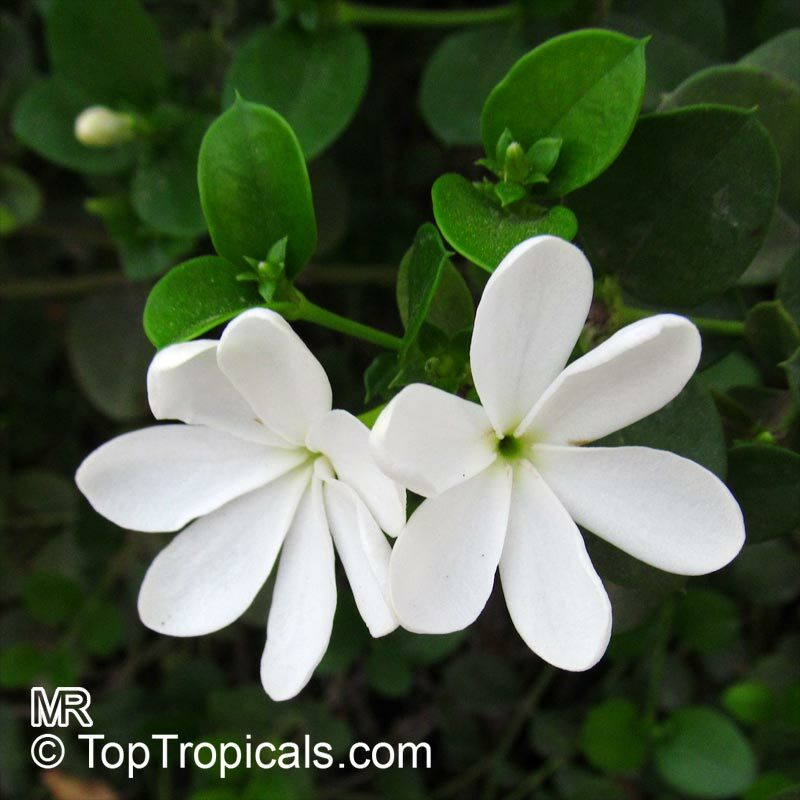 The most fragrant purple brunfelsia and the rarest in cultivation. Everbloomer! 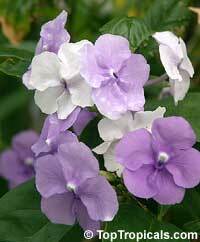 The large purple flowers are fragrant all day and night long. Flowers are the largest of all brunfelsias, up to 2" in diameter. 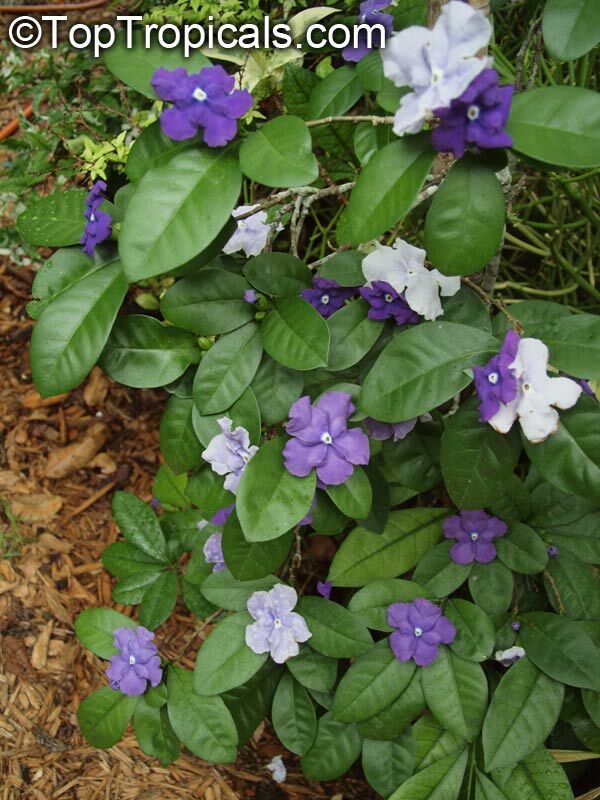 Leaves are waxy and shiny, and larger than other brunfelsias. Powderpuff - dwarf everblooming variety. 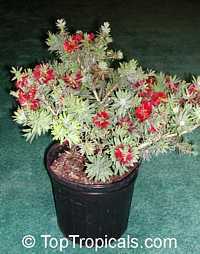 Drought tolerant, easy to grow plant. It stays very short 2-3 ft tall, gets dense and bushy, no pruning needed. Rose cascade, Blood Red Tassel Flower. 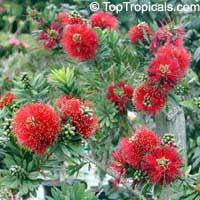 Bushy small tree or large round shrub with 2-3 inches flowers, big red puffs, in winter and spring. 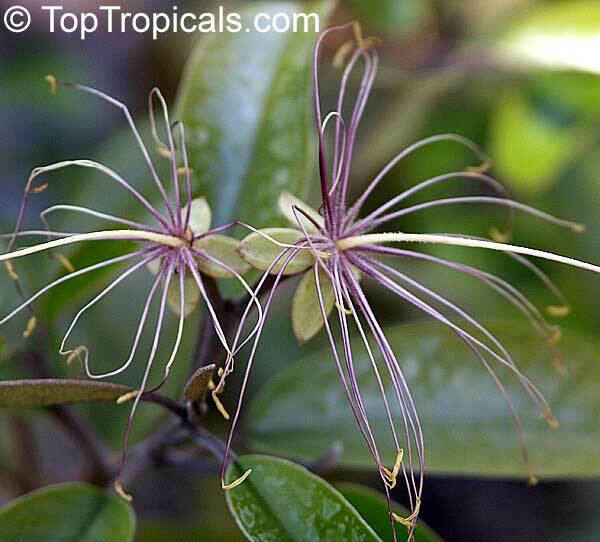 Nice landscape plant, very fast growing. Very rare white powder-puff. 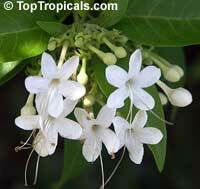 Large bushy shrub with spectacular white flowers during spring-summer. Thge plant is relatively cold hardy. Fast growing. Pink Powderpuff, Shuttlecock. 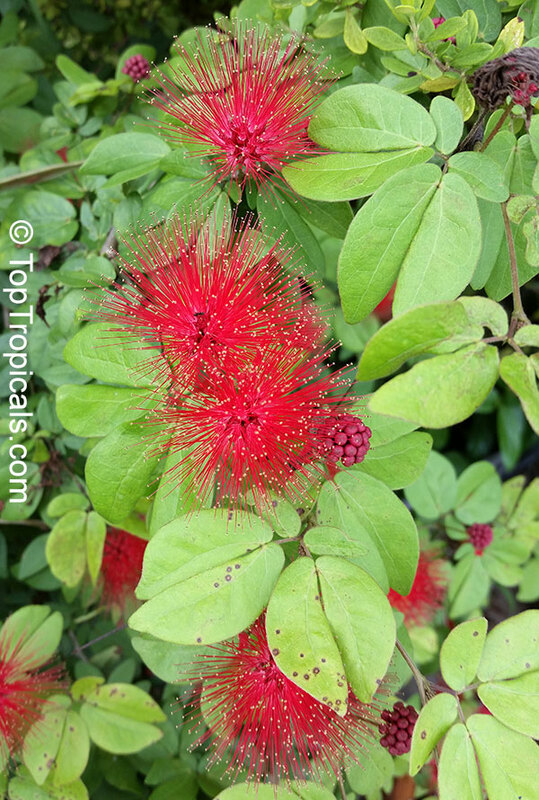 Attractive shrub with finely divided leaves and clusters of red powder-puff flowers. 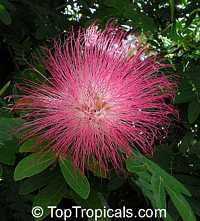 It is native to southeastern Brazil, Uruguay, and northern Argentina. One of the most beautiful of the Calliandra species, it is a medium- to large-sized shrub with a graceful growth habit. 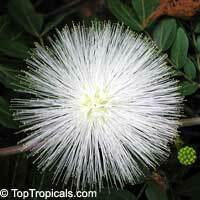 Silky, pink-white, powder-puff-like flowers appear during the summer months. The fine foliage is an attractive mid-green color. A low branching shrub or small tree with multiple trunks. 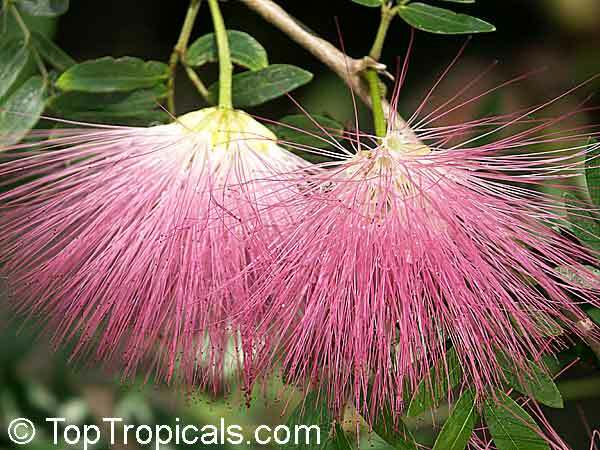 Showy pink flowers, like a powderpuff, are bright pink on the surface and pale pink to white inside the "powderpuff" ball. This is a excellent container plant for the cooler climates and for the warmer regions a beautiful outdoors plant. The beautyberries are packed tightly together in clusters that encircle the stem. 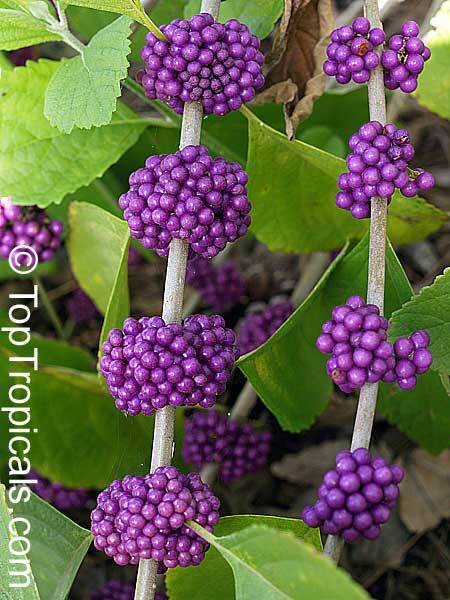 Spring flowers and beautiful fall fruit make this an attractive landscape plant. 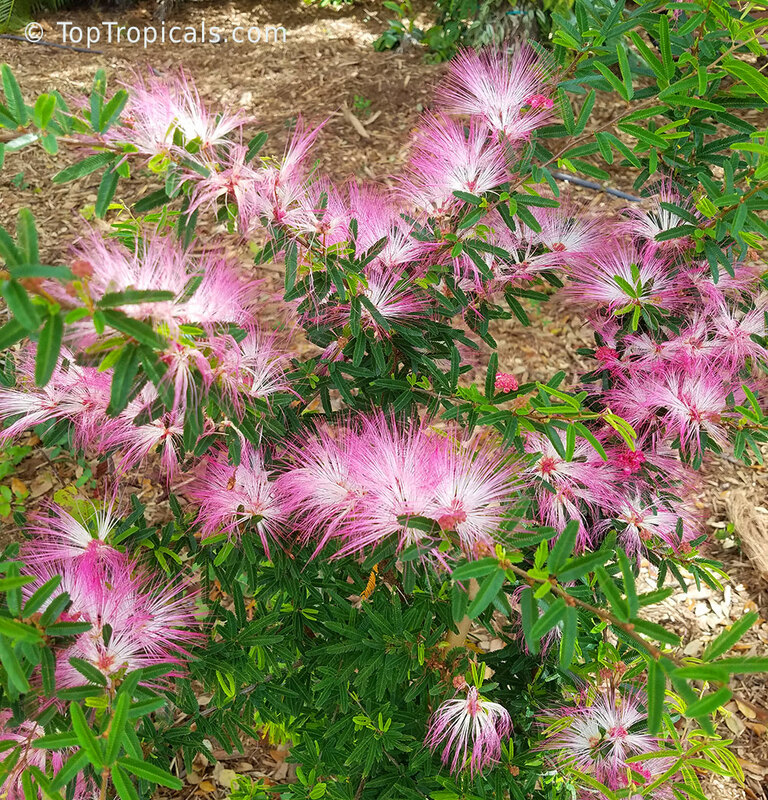 This Florida Native is easy to grow: pretty hardy and very drought tolerant. Tea plant. 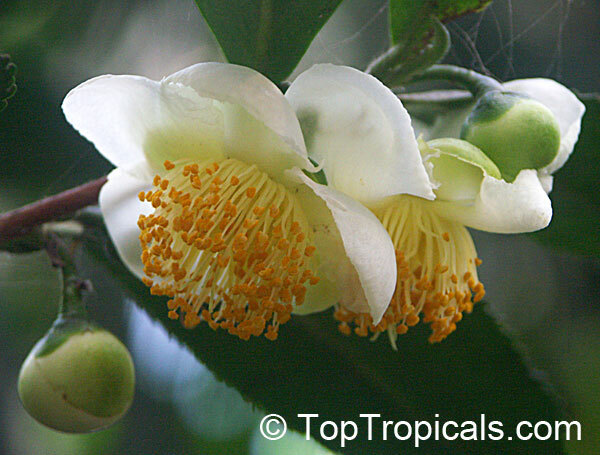 Yes, tea comes from a camellia! 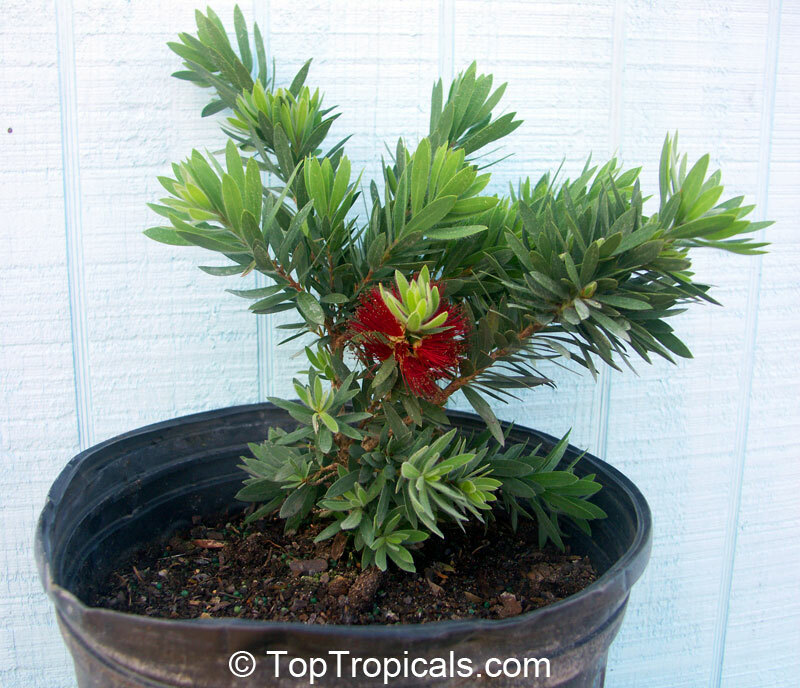 Small evergreen tree, usually pruned back to shrubs in cultivation. Interesting white flowers with golden stamens in fall and winter. Tea is the second most commonly drank liquid on earth after water. 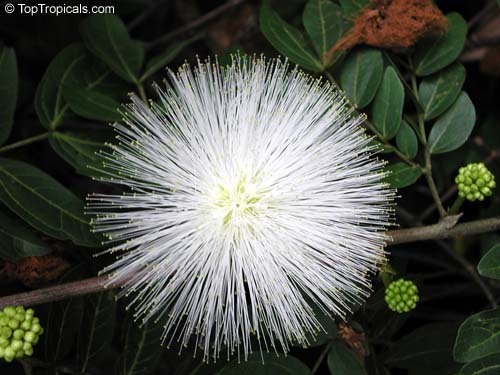 It has numerous medicinal benefits mainly due to its antibacterial and antioxidant properties. Winter Cinnamon, Wild Cinnamon. It is a salt tolerant large evergreen shrub or small tree native of Florida and tropical America. Purple and white showy flowers cover the tree in summer and fall followed by bright red berries clustered near the tips of branches. Leaves are very aromatic. 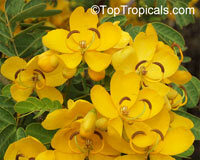 Cassia (Senna) bicapsularis - Butterfly Cassia, Scrambled Egg Bush, Butterfly Bush. Showy flowers resembling butterflies. Easy-bloomer through fall and winter, and easy to grow. Attracts lots of butterflies. 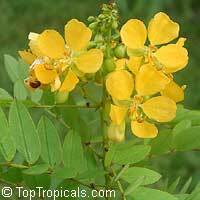 Bahama Senna. 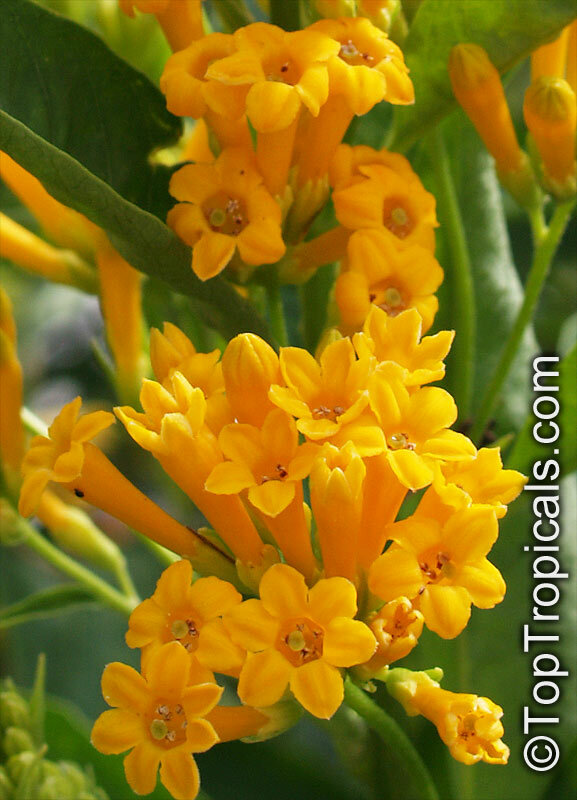 Low growing shrub with dense foliage and profuse, showy golden flowers. 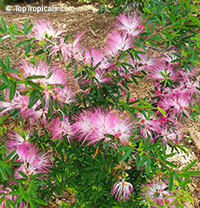 Drought tolerant, easy to grow. Good for small places or container culture. Popcorn Cassia, Peanut Butter Senna - A shrub or small tree producing golden-yellow flowers with a distinct scent of peanut butter that open from brown buds in late summer and autumn. 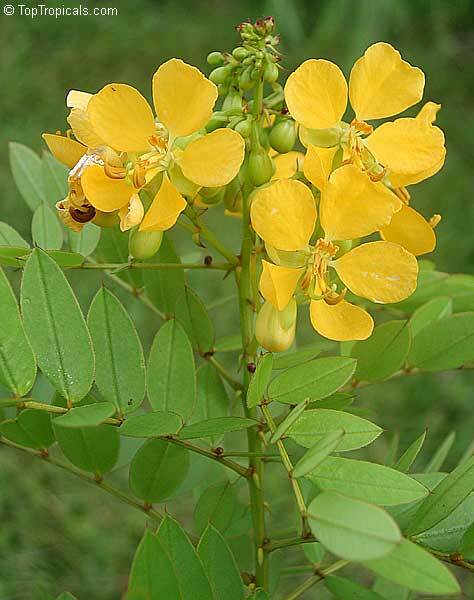 Also called Popcorn Cassia, because it smells like fresh cooked, buttered popcorn when you run your fingers through the leaves and then smell. It blooms beautiful large clusters of sunny yellow flowers. Eastern Redbud, Judas Tree, Love Tree. 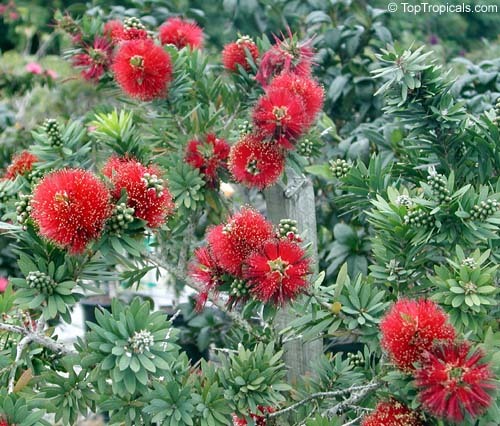 A popular small ornamental tree. 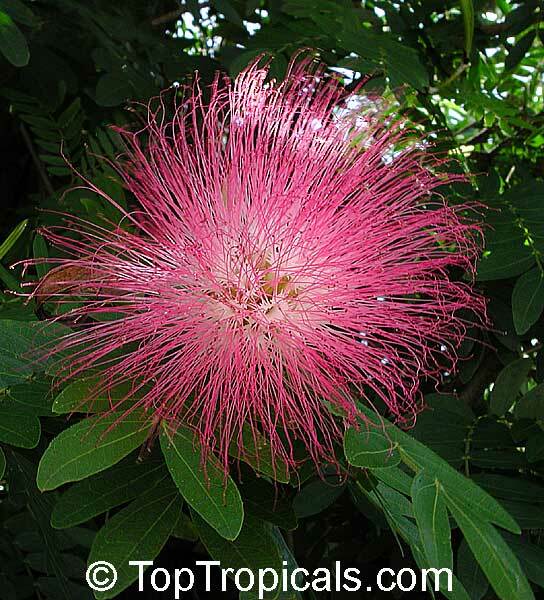 In spring it is covered with showy pink flowers. Adaptable to many types of soils, soil pHs, dry soils, and other moderately stressful situations. Very cold hardy (to hard freeze). 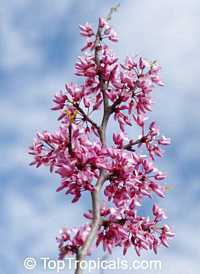 The plant may be leafless during fall-winter. Yellow Cestrum - great butterfly attractor. 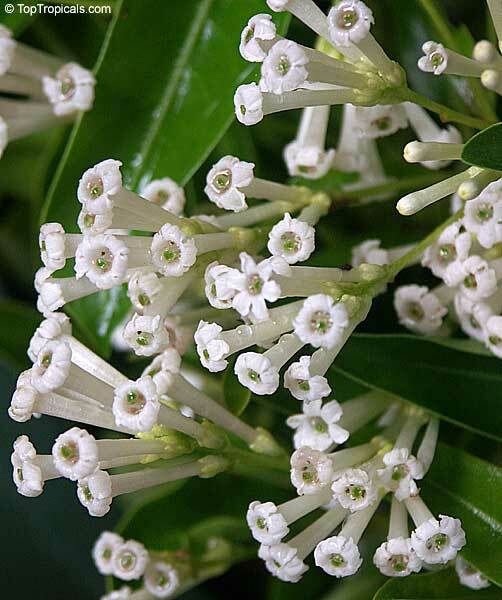 White Chocolate Jasmine, Inkberry, Day jessamine. 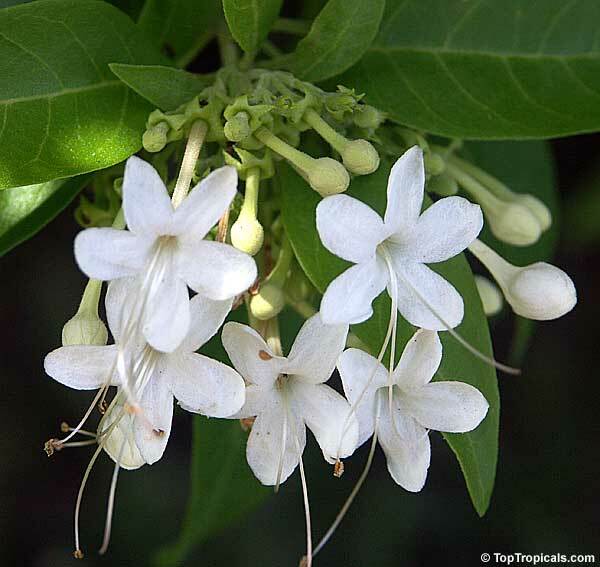 Unlike Night blooming jasmine (Cestrum nocturnum), this one is most fragrant during the day: flowers have very strong chocolate scent, as good as fragrance of famous Portlandia. 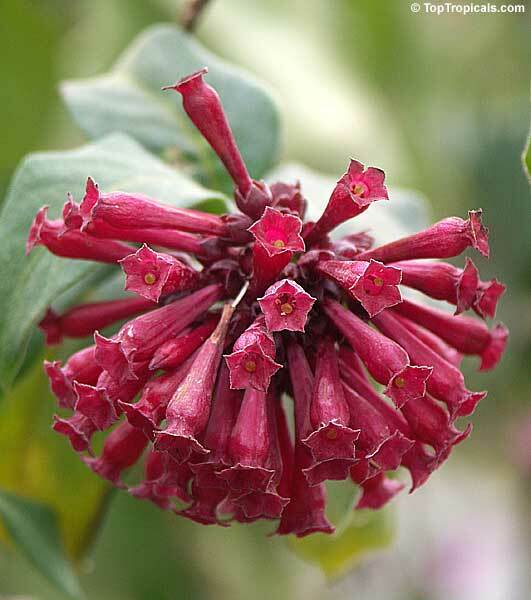 Butterfly flower, Red cestrum. An winter blooming butterfly attractor! Beautiful deep red flower clusters. Low water need once establish. 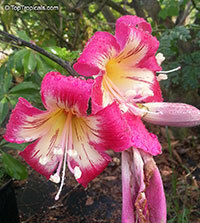 Pink Silk Floss Tree. One of the most beautiful trees in the world. In full bloom, there are almost no leaves. You see a huge mass of color with 10s of thousands of flowers. Premier tree choice for your landscape. 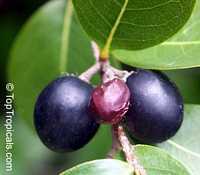 Cocoplum. Easy care shrub that is used often as ornamental or a hedge; it produces edible fruit. The mature fruits are 1 to 2 inches in length and ovoid or globular. The thin skin of the fruit varies from pinkish white, to red, to purplish black. The white, cottony pulp adheres to the single large ridged seed and is somewhat insipid in taste. The cocoplum is generally stewed with sugar after the skins have been removed. 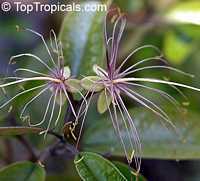 It can also be used for jelly and jam, and the seeds can be roasted as nuts. 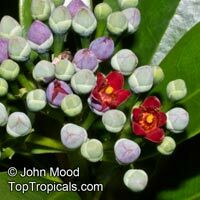 The plant is highly tolerant of salt, so it is often planted to stabilize beach edges and prevent erosion. Fiddlewood, Boo-nge Saaree. 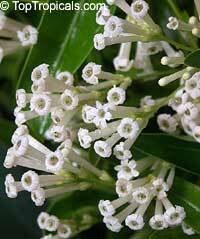 Beautiful small tree with long tassels of richly scented white flowers. Flowers are pendant and cover the tree from spring to fall. Great butterfly and bee attractor. Tree of little stars, Escambron, Tamourette. 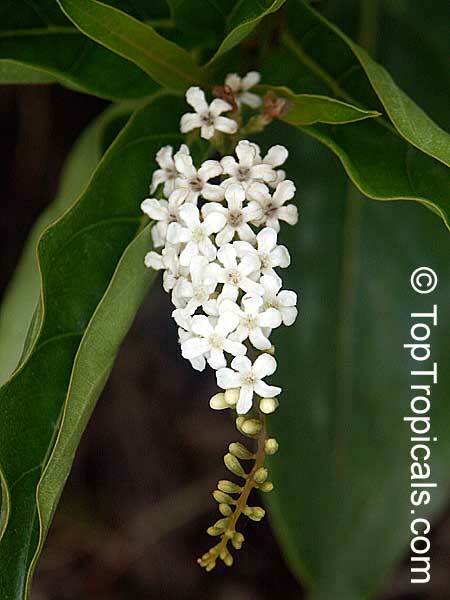 Medium size shrub with white star-like flowers, slightly fragrant. Stems are spiny. 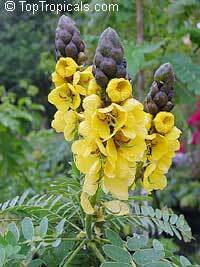 Can be trimmed into a nice bushy specimen. This plant can be used for bonsai culture.